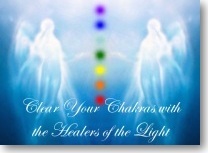 These two meditations, Clear Your Chakras with the Healers of the Light and Cleanse and Clear are incredibly powerful! The angelic realm gently guide you to release the debris of fear that is your "normal." Together with Kate you step into your power as the limitless spiritual being that you are - "fear free" - and move into the the higher vibration of love and light to make life on Mother Earth easier. Need a CD? Contact Kate!